“Abby, come quickly to the garage.” I knew she would be so excited to see the chunky caterpillar crawling on the floor. As predicted, she was thrilled by my discovery and wanted to keep him. Minutes later, our little friend had a new home in a plastic container filled with grass and leaves. Abby awoke early the next day to check on the critter. To her surprise, the caterpillar had incased himself in a cocoon at the top corner of the plastic box. We were so excited because we knew it would only be a matter of time until a beautiful moth would emerge from the cocoon. It is so fascinating to watch God at work in the life cycle of insects and how He transforms them into new beings. Now, my daughter and I are waiting. And waiting… And waiting… We check the plastic container several times a day to investigate for signs of change in the cocoon. Sadly, the encasement is dormant, no activity has been detected. It is hard for us to be patient and continue to wait. We are ready to see the beautiful designs on the wings of this new creature. The moth has reminded me that sometimes in life, I have to learn to be still and wait on God. Many times I pray diligently for specific areas of my life and I sense God telling me to wait- wait on Him for His perfect timing. I have faith God has good things in store for me. I’m reassured God will help me grow and mature, just like the moth is growing and maturing right now in its cocoon. I need to pursue an attitude of forbearance and wait on the perfect timing of my Savior, for He knows what is best for me. 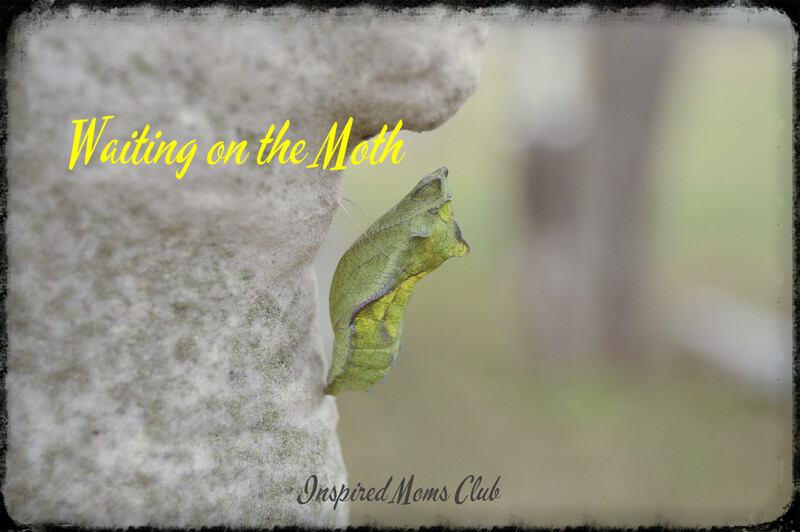 Maybe you have a “moth” that you are waiting on in your own life. Do not lose hope. Waiting is rarely ever easy. But find hope in reflecting on what the moth begins as and then to the wonderful transformation that entails. God wants to help us become beautiful beings in His sight. We just need to trust Him to complete the metamorphosis.